Airtel offers 1000 GB free data as already said by the telecom company in July 2017. The plans starting at Rs 1,099 in select cities which also including the head of the nation, Delhi. This is remembrance, while the official announcement was already made by Bharti Airtel on its micro blogging social media site. 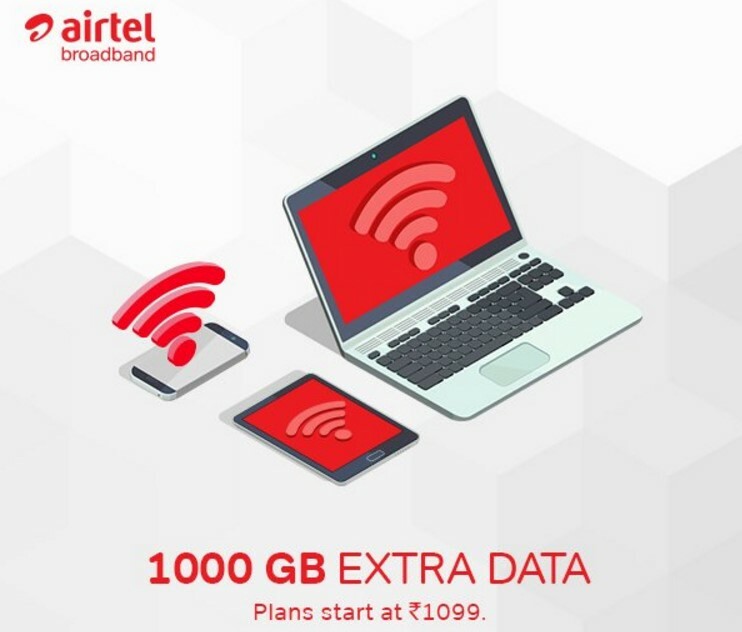 Under the tagline of Airtel broadband big byte offer, the company offered the data for lowest price against to the Reliance Jio as competitor in the industry. The Bharti Airtel announced the Independence Day offer, by using this, users can get up to 70% cashback on recharges, bill payments, utility, and online merchant payments with Airtel Payments Bank. Also, the user can get additional data under the same scheme by the name of Bonus Data which having the validity until March 31, 2018. Note: Online purchase is must for this offer. The benefit of additional data 1000 GB starts at the Rs. 1,099. It covers the speed up to 40 Mbps per second. According to the website, the broadband plan at Rs. 1,799 per month which comes at the speed up to 100 Mbps. Based on the location (Cities), the offers varying with respect to the plan. In Bangalore, 1,000 GB offer comes only in the Rs. 1,299 plan. In Chennai, the company offering 1,000 GB extra data benefit in two plans such as Rs. 1,249 and Rs. 1,499. In Hyderabad, the 1000 GB Bonus data is avail on the plan of Rs. 1,999.